As an ESL teacher, I often hear from classroom teachers that they don't always know where to start when it comes to working with beginning English language learners (ELLs), or newcomers, in small guided reading groups. 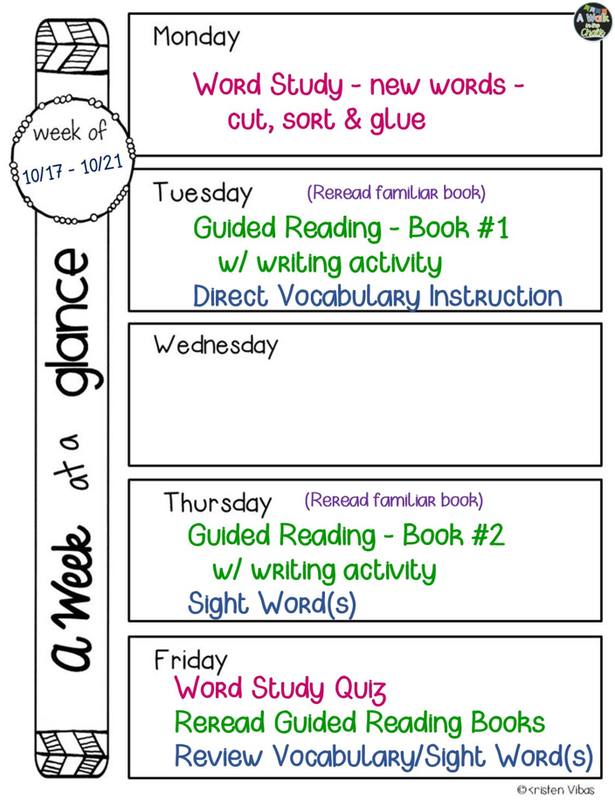 In this post I'll share a typical "guided reading" lesson that I would give to my beginning ELLs, as well as a glance of at what a typical week would look like. Let me start by saying, the very first thing I do before I start instructing my newcomers is, I assess what they already know. First, I see if they have literacy skills in their native language...can they read and write? Then, I see if they know alphabet letter names and sounds. Next, using the DRA2, I assess their reading level. Since they don't have English literacy skills yet, their reading level typically starts at level "A" (emergent). I can say that most students do have some literacy skills in their home language, and often times, many know some letter names and sounds. So now I've got my starting point! When I first begin working with my newcomers, the main components of reading that I typically focus on are vocabulary, phonological awareness/phonics and sight words. So a typical week would encompass all three of these components into my targeted lessons. Down the road I add comprehension skills, but they are not ready for that yet. Step 1 - Choose an appropriate book. I carefully select books that have relevant vocabulary. For the most part, my main focus is building their vocabulary. The literacy skills in their native language will transfer to their new language, however, they have an extremely limited vocabulary, so... vocabulary, vocabulary, vocabulary! I chose this book because I wanted to teach my students the word "big." It's also about animals, and I know that most kids are interested in reading about animals! I used gestures to SHOW them what "big" means. It's important to be mindful of your students' age when picking out books. You don't want to give 4th-6th graders books about bunnies or teddy bears. Try picking age appropriate books; which I know can be a challenge if the selection is limited, but you don't want your students feeling embarrassed. Step 2 - Preview the book. Point to and say each animal's name and have the students repeat the names back to you, keeping in mind to speak clearly and to enunciate the sounds in each word. It's important for them to hear how to pronounce the names. A side thought...Think about "A" level books... they are not created with English language learners in mind. "A" level books have repeated sentences, which are GREAT, but they also have very specific vocabulary that students are expected to decode using picture cues. In the book my students read last week, the repeated sentence was, "We go to the _____." The pictures show the family in different locations like the pool, park, library, soccer game, etc. In one picture the family is standing in front of a large fish tank. If I asked English only students where the family is, some might say a fish store or they might even guess aquarium, depending on their background knowledge. Then they'd cross check their thinking with the word and see that it begins with the letter "a" and hopefully they'd say, "It's an aquarium!" But our newcomers don't know what a big fish tank place is called in English, so it's important for us to support our students by saying the names of each vocabulary word. Step 4 - After reading, review the animal names. Point to an animal and see if they can remember the name. Perhaps make a matching activity with animal pictures and names. Support as needed. Encourage a LOT! Step 5 - I always provide a guided writing activity based off of the book we just read. 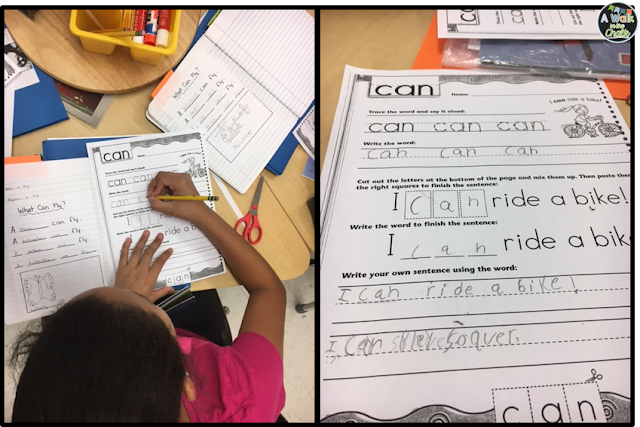 I use sentence frames to support their thinking and writing. Sometimes I create my own, like the picture below, and other times I'll use a graphic organizer as a follow up activity. On this day I wanted them to understand the meaning of "big," so their writing supported this goal. As they finish their writing activity, I'll ask each student to read some of their writing to me. Then they'll draw a quick picture, which I always ask them to label. I know that my newcomers don't understand every word in the book, and that's OK! They are being exposed to new words and ideas in a repeating format. I want them to get used to the structure of our lessons so that they know what's expected. So, here is what a typical week of small group work entails for my newcomers. Knowing what the focus is each day helps me to zone in on their learning goals. This schedule works for me and my students. The variety keeps it fun and interesting, yet it's consistent so that they know what's expected. As you can see, on Tuesdays I include direct vocabulary instruction, either using the vocabulary from the book, like the animals, or monthly themed vocabulary, or content vocabulary from another content area. 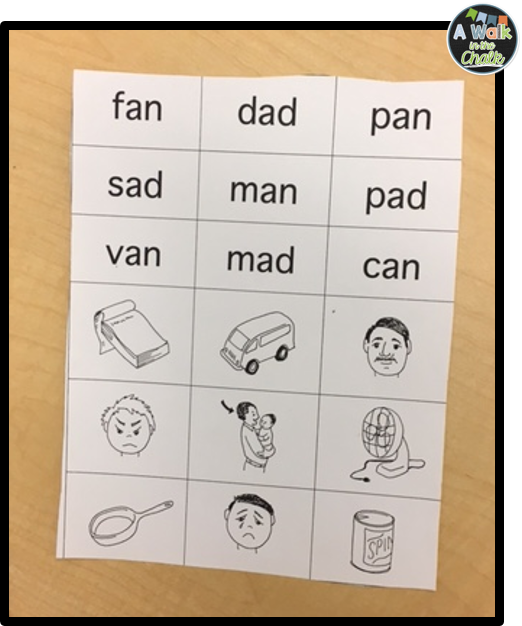 One activity I have my students do with their vocabulary is use the K.I.M. Strategy. 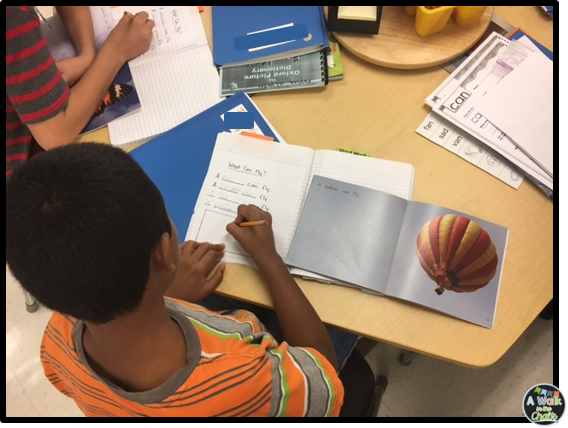 In their notebook they write the key word (K), important information (I), sketch a memory clue (M) and write a sentence (S). For my newcomers, I leave out the (I) portion. They are not ready for adding "information." 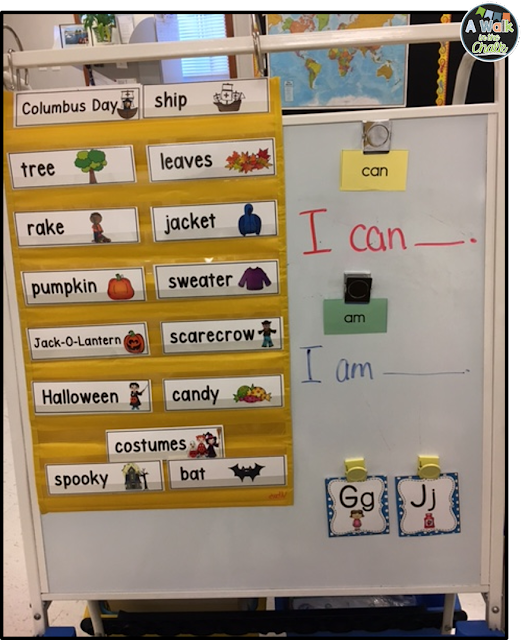 Right now the goal is for them to learn the names of things and simple sentence structure. My higher ELLS definitely include all components of the K.I.M. Strategy in their notebooks. This is what the K.I.M. Strategy looks like. 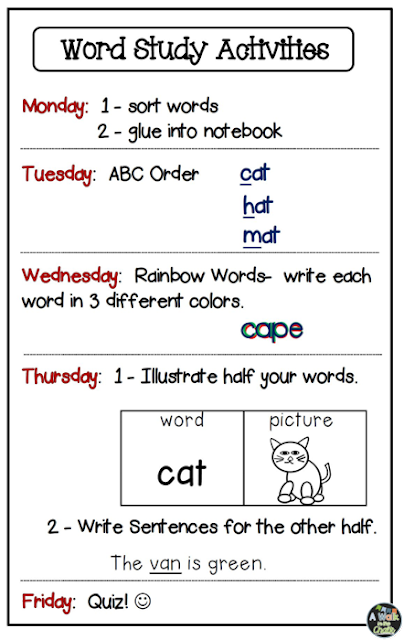 I do teach sight words throughout the week, but on Thursdays we always have an extension activity for one of them. As an "exit ticket" I have them orally use the sight word. Today, I asked each student, "What can you do?" And they responded with "I can _____." Then they get a high five, a sticker (big kids like stickers too! ), or some encouraging praise. 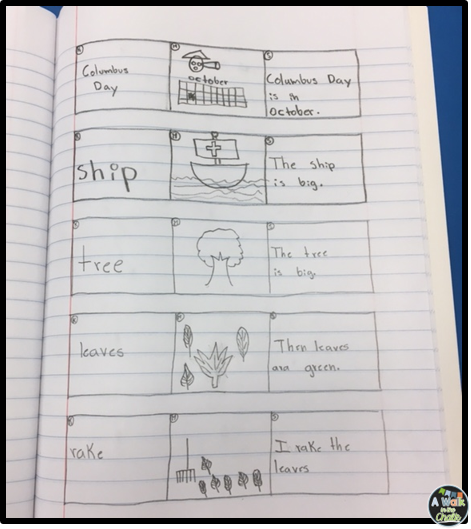 I also include Word Study activities in my small group work. I like using the sorts from Words Their Way. Each Monday they receive a new spelling pattern. Remember, I assessed my students to see what they already knew. Most already knew initial sounds, so I started them with word families. If they did not know initial sounds, I would've started there. I do have one student in this group who does not know many initials sounds, so I spend a little extra focus with him on initial sounds. My newcomers use this activity to learn spelling patterns AND vocabulary. They are introduced to their new word list on Mondays, then they have independent activities to do with their word list throughout the week. (It's so important to set newcomers up with meaningful activities that they can do independently during Reader's Workshop.) Below is their Word Study Activities list. It gets glued into their Reading Notebook. 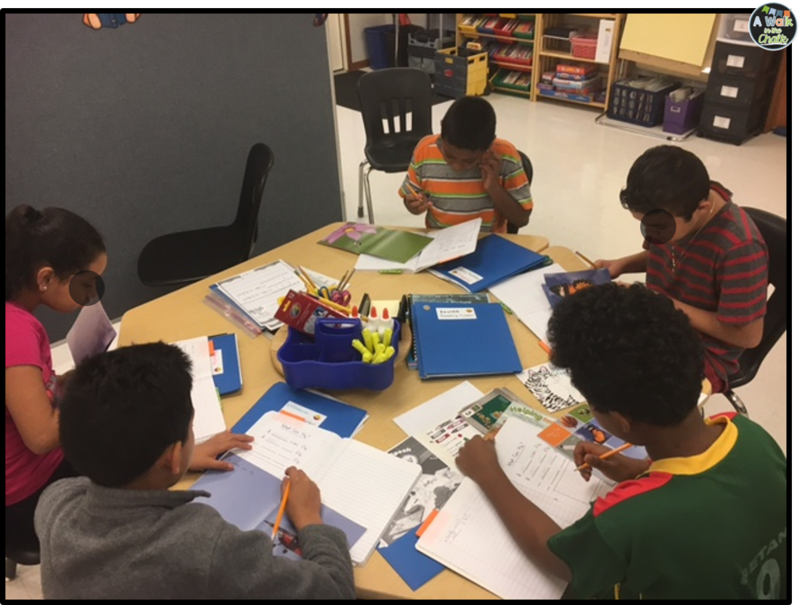 On Tuesdays, Wednesdays and Thursdays they work on their independent activities. Friday is Word Study Quiz day! And that's what small group instruction looks like with my newcomers. To recap, assess what students can do to evaluate your starting point. Focus on building vocabulary, sight words in context, word spelling patterns and choral reading to start. 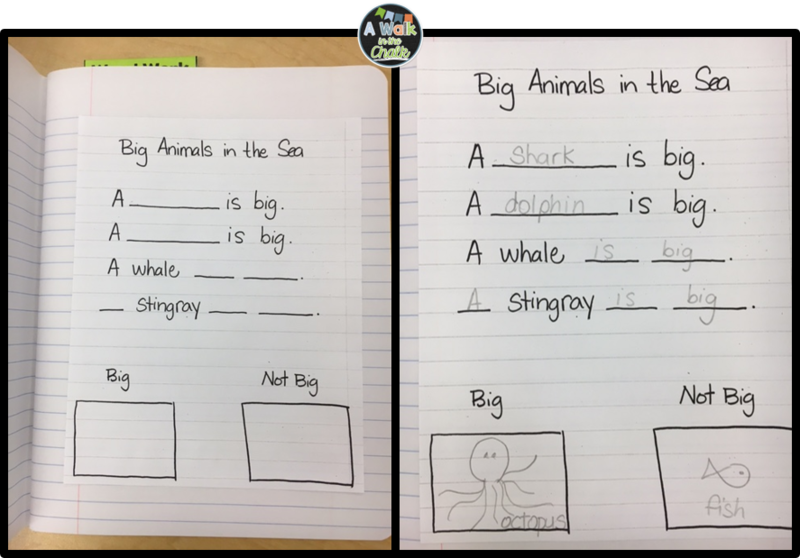 My guided reading lessons usually looks like... preview the book, front load main vocabulary, choral read, and end with a guided writing activity with sentence frames. Here's a TIP: Many times I make my own guided writing activity based on what I want the students to learn from the book. 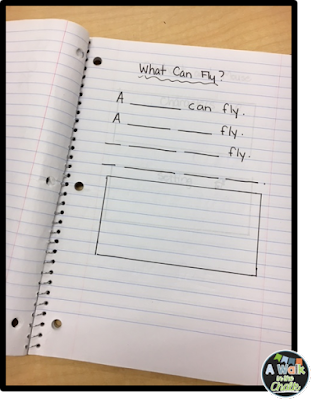 I'll write the activity in my notebook, make copies, cut them to size, then have students glue it into their notebook. Keep this notebook! You may get a newcomer next year, and when you do, many of your guided writing activities will already be made. You'll just need to find the book that goes with the activity. My notebook where I write out the guided writing activities. I know that many school districts lack ESL resources and often times the classroom teacher is the only one providing instruction. Knowing where to start with beginning ELLs is probably the biggest challenge. I hope that this post gives you some ideas about where to start and what to focus on with your new students. Read more about K.I.M., a highly effective vocabulary strategy, here! I love love LOVE this post! You have shared such great, meaningful strategies that would work wonderfully with beginning ELLs! I've never heard of the KIM strategy. Thank you again! Hi Deb!! Thank you for your comment;) I recently shared the KIM Strategy at a staff professional development as a strategy to build knowledge of content area vocabulary. The kids really like it, so that's a win-win! What a great post, Kristen! 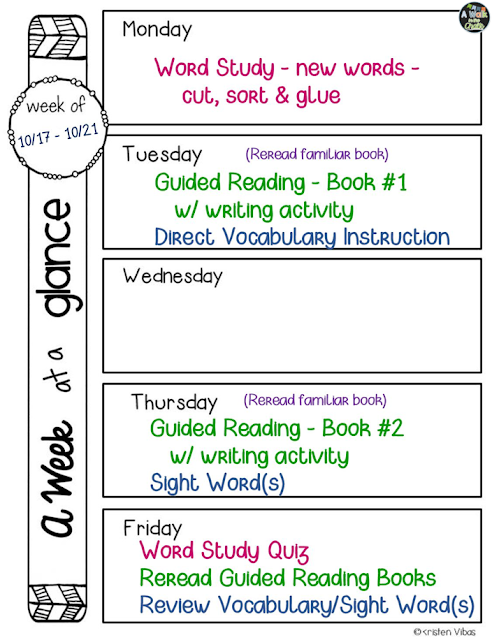 I love the way you laid out your week for others to read! Excellent ideas for scaffolding and including all learners. I especially like the K.I.M. strategy. I will be adding that to my repertoire. Thanks for caring and sharing! 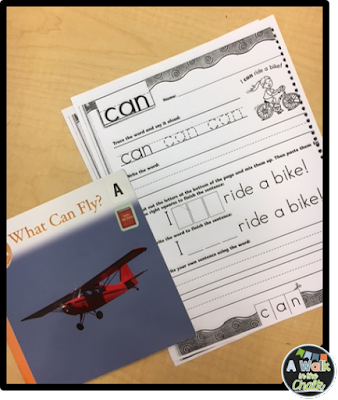 Where are the sight word worksheets from? Sherice, thanks for your patience! The sight word book I use is called "Write and Learn Sight Word Practice Pages." I added an affiliate link at the bottom of the blog post that'll take you straight to it, if you're interested. Great post and ideas! How long do you see these students each day? Hi! Thank you:) I see my newcomers 4-5 days a week for about 30-45 minutes each day. Thank you for writing this out! So valuable! Thank you so much for this amazing post! 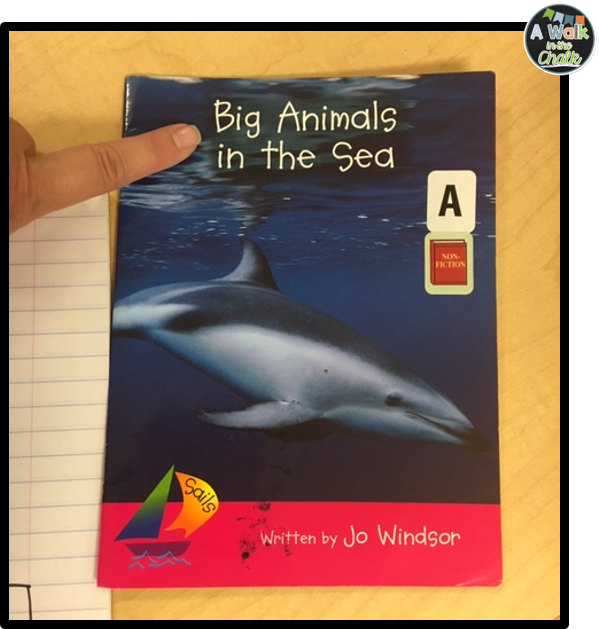 What books do you use for guided reading? Any particular series? Hi Jacqueline! I use whatever I can find in my school's book room that's appropriate for my newcomers. I look for books that are age appropriate and with topics that my students probably already have some background knowledge with. Do you have access to sets of low level books? Hi, I see you left Wednesday blank. Why is that? Hi Kristen, I love your Blog! You have such amazing ideas and resources! I'm teaching ESL in a new district and looking for some new ideas. 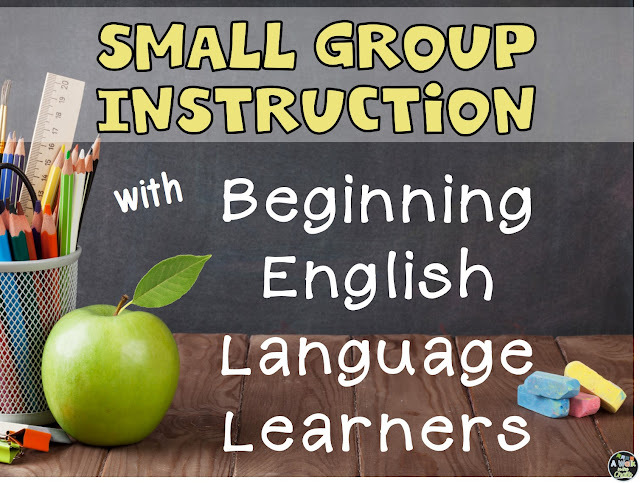 Do you have a small group plan for ELs at the Intermediate stage or do you follow the Beginners plan (A Week at a Glance)? Thanks for sharing your knowledge!